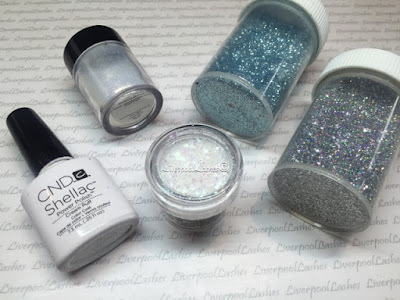 LiverpoolLashes Beauty Blog: My Work: Cinderella Nails! Rachael is off to a Florida with her friends in a couple of days and wanted princess nails. We chatted a little about the different princesses and eventually decided on Cinderella as a theme as Rachael loves blues and greens. 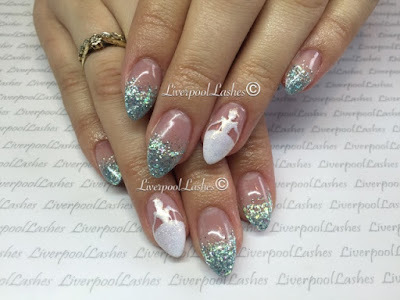 I mixed a holographic silver and a unbranded blue glitter together with white Mylar flakes and a little Lecente Stardust Glitter in Milky Way with clear acrylic powder, applying it to the tips of all nails apart from her ring finger in a fade. I did then mix more Mylar flakes with clear powder separate and applied some more over it before finishing off the rest of the nail with a clear overlay. For Rachael's ring fingers I did a clear overlay and painted the silhouette of Cinderella in CND Shellac in Cream Puff. Once cured I then applied Lecente Stardust in Milky Way over it. I have to say these nails are possibly a favourite that I've ever done. I just thoroughly enjoyed doing them and I think Rachael is very pleased with them! I think these are the best you've ever done too. They are STUNNING!